Chloé will launch Love Story Eau Sensuelle, a new fragrance for women. Love Story Eau Sensuelle is a flanker to 2014's Love Story. The sun sets on Paris. The rooftops are silhouetted against the amber sky. A slight breeze runs along the banks of the Seine. The day fades out, replaced by the excitement of a blooming romance. A soft and playful love story unfolds at dusk. He is fascinated. She is unwittingly seductive. She perfectly embodies Chloé’s femininity. She exudes sensuality. [...] this original fragrance reveals a new facet of the line’s signature scent of orange blossom. Blended with sunny notes, almost vanilla of heliotrope, the orange blossom is sweeter and more romantic than ever. Its sensuality is sublimated by a sandalwood chord. Velvety and slightly milky, it gives depth to this elegant fragrance. A new olfactory poetry. A new love story seen through Chloé’s eyes. Love Story Eau Sensuelle was developed by perfumer Anne Flipo and Domitille Bertier. 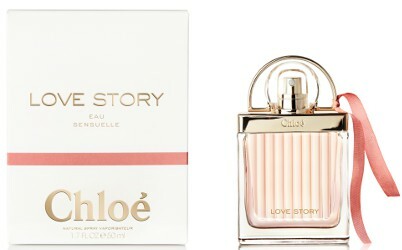 Chloé Love Story Eau Sensuelle will be available in 50 ml Eau de Parfum (and presumably other sizes as well). I smelled this on a mag strip the other day. It is not so bad there are a few greenish notes in the top too – more of a spring/summer frag than winter though. Interesting — maybe I’ll like it better than Love Story.